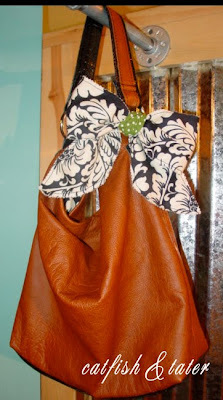 Catfish & Tater leather handbags are now available at Apricot Lane in Zona Rosa. Check out the link - so cool to see some of my handbags on TV. As many of you know - I make unique and one-of-a-kind handbags. It's so fun and very rewarding to make something that not everyone else will have. I just finished the new slouch style bag I have been working on for a while. I LOVE how it turned out. This style of handbag is so easy to carry and is cute at the same time. It is made out of a medium brown soft leather with black patent crocodile accents, and the double sided bow is the icing on the cake. I will also have separate "bow packs" for sale so you can change the bow to match your outfits. It has a full lining with pockets for cell phones and a magnetic closure to keep things secure. You can also custom order any of my handbags in an array of leathers & linings to suit your taste. This style sells for $225. 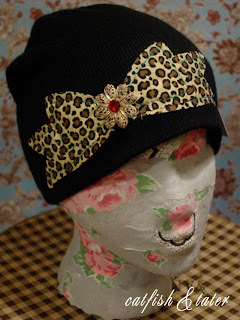 It's been a while since I posted to my blog, but I've been really busy lately working on new items for the shop: from Tees to Scarves, Handbags to Headbands. Pictured (to the left) are a few of my fun new headbands I just made. Each one contains new and vintage pieces to make it something very unique. 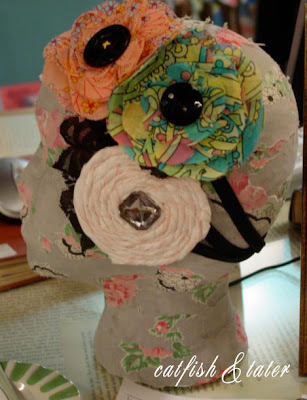 They are so great to add a POP of color to your outfit or just spice up your hair-do. 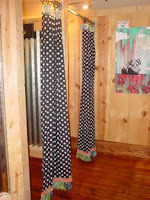 There are others in the shop that are cute as can be - so be sure to stop by soon and check them out! These are also great as gifts - and Valentine's Day is just around the corner. It's been a while since I last posted on my blog. I know I need to keep up with this more, and I always have good intentions, but it always falls to the side in my shuffle of things to get done each day. So, since it's a nasty day outside and I've been working on the computer today, I thought I should post something new. I had a great Holiday Season at the shop and appreciate all the people who support me. It's great to know that there are people who like what you do. It's what keeps me going! 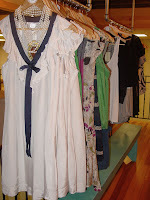 There's been a lot of clothing come and go at the shop this season. I have some coats and WINTER items left to help keep you warm and toasty. And as always - more on the way. It's hard to believe that some shops already have SPRING items out - especially when the windchill is -25 and snow is everywhere. It's just the way the industry goes though. So - to help brighten up your days, I have some more "Spring Inspired" styles coming in as well as more "Winter" styles that will keep you looking cute & warm at the same time. I hope to see you all in the shop soon. There are ALWAYS specials & sales going on, so don't hesitate to stop by so you don't miss out on a good deal. OH - be sure to check out "catfish & tater" on Facebook and add yourself as a fan. You will get special updates & deals for the shop. As many of you know, I opened a new "catfish & tater" location in Liberty, MO this May and then merged my Lee's Summit store with the new location mid-June. It was sad to leave Lee's Summit and I know there are customers that are sad too, but I am only a short drive away. Still here - just in Liberty. I have already seen some of my regular LS customers in Liberty, so that is a good thing. My new location is also shared with another business, Sole Salon. It is located on the main level and I occupy the loft area inside the salon. We just had our "Grand Opening Party" which was a huge success. We had a DJ, food, prize give-aways and so much more. Hope you were there to help us celebrate! 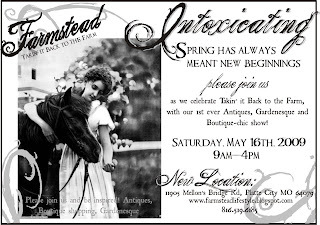 I will have a booth at the Farmstead Event on Saturday May 16th. 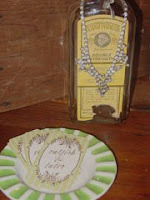 It is an all day affair with antiques, handmade items, apparel, gifts and much much more. Tickets are $12 in advance (includes admission & catered brisket lunch from Six in Liberty). You can also purchase admission tickets the day of the event for $5, lunch will NOT be included. It's located in a beautiful country setting in Platte City, MO. 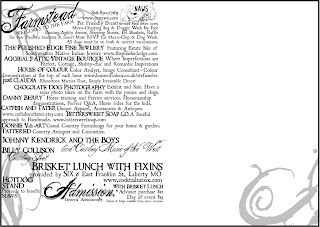 It's going to be a fun event that you don't want to miss.... Postcard with info and map attached. New Spring Handbags HOT OFF THE PRESS. For those of you who have been asking about new handbags - the wait is finally over! Here's a preview of some of the new styles I have been working on. This Spring I am introducing the XL clutch - it is a "must have" for the season. They hold so... much and make a great addition to any outfit. And as always - they are all unique & handmade. Set yourself apart from everyone else with a "catfish & tater" original.